February Samba Wins Are Here! This February you get to dip and spring upward to the beat of Samba music when you spin the reels of Mr. Sloto's favorite dance-themed slot with up to a 225% Bonus + 50 Spins! Deposit $25 and you'll enter the spontaneous and thrilling world of Samba Sunset where free spins, multipliers and rewarding fun bonus features await. Extra dancers appear on the reels for even more free games! 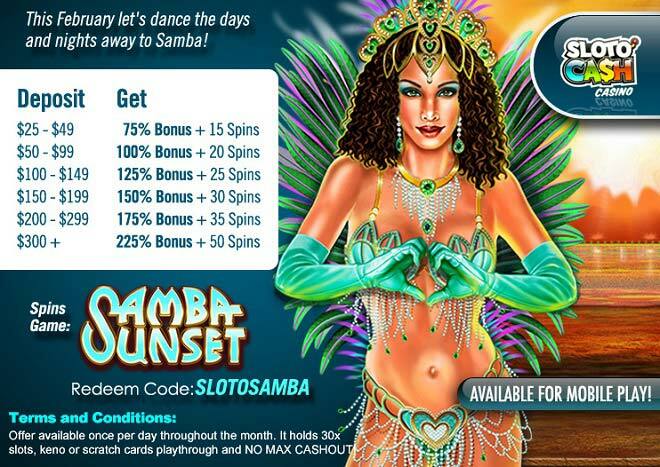 Dance to the beat of wins this February with a bonus of up to 225% plus 50 Free Samba Sunset Spins!